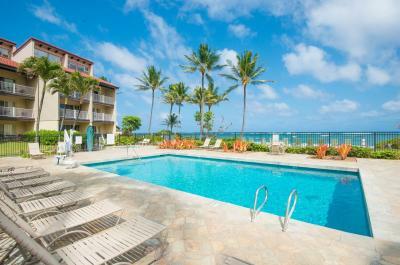 Kapaa Shore is a beachfront resort on Kauai, and features ocean view condo rentals with amazing resort amenities. Recommended in Frommer’s Kauai Guidebook, Kapaa Shore Resort is breathtaking and a spectacular vacation destination. You will appreciate the courteous staff and resort services that make staying at the resort a dream vacation. Kapaa Shores resort rentals include features such as ocean or pool views, queen size beds, cable flat screen TVs, wireless high-speed internet, and full kitchens. Take advantage of the tennis courts, shopping, fine dining and nightly entertainment lovely strolls from your Kapaa Shore accommodations. But you can spend days at the resort and never get bored with the swimming pool, family size hot tub, or just gazing at the ocean watching for humpback whales. Come and stay in one of the most attractive affordable & conveniently located Kauai vacation condo rentals on the beautiful and charming Coconut Coast of Kauai.